GM has declared that the Chevrolet Volt is the company’s future, and we can see why after spending a good amount of time behind the wheel of an early test mule. The experience met every expectation we had about the extended-range electric vehicle. It was electric-quick, had instant torque, and was strikingly quiet. The test mule shows great promise that the Volt will be everything GM’s savior should be. Bob Lutz, Vice Chairman of Global Product Development and an all-around man’s man, along with Frank Weber, the Volt’s chief engineer, chatted with us a bit before we got behind the wheel. It’s clear that these high-up GM suits feel very strongly that the Volt is something special. Many, including myself, have called out GM for largely ignoring consumer diesels and hybrids, but I finally understand their positive outlook after our drive. The test mule we drove clearly shows that the Volt and Voltec platform has a bright future. Really, besides the lack of engine noise in EV mode and the single speed transmission, consumers shouldn’t notice anything different about driving this car. And that’s the way it should be. 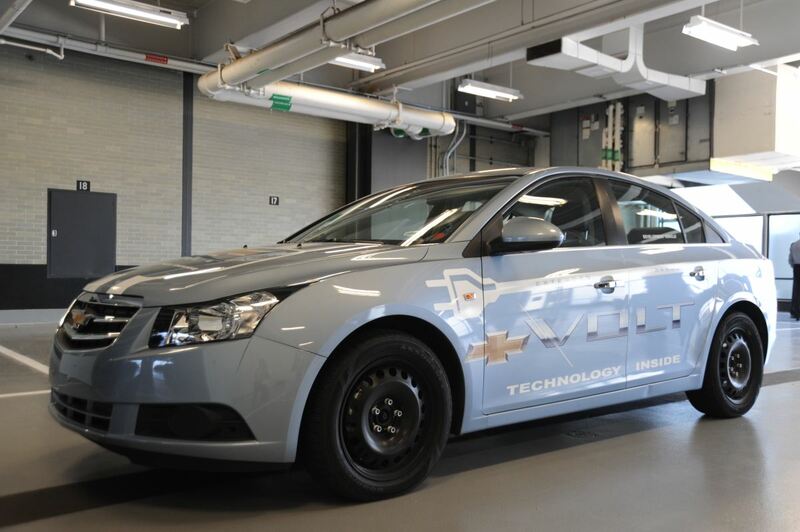 The Volt will be a midsize car just like the Chevy Cruze test mule. The ride and handling wasn’t tuned in this early prototype as it was assembled for propulsion testing, but it still rode fine. The electric motor, however, was spectacular. There weren’t any annoying whines or high pitched squeals that normally accompany an electric motor. The tires were the loudest part of the drive. 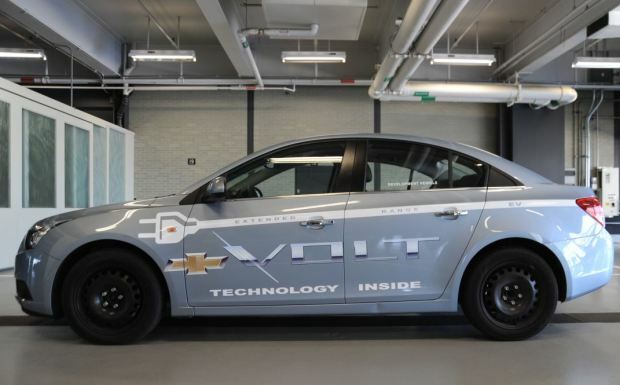 GM is stating that the Volt will get up to 60 mph in around 8.0 seconds and is done by the electric motor only. That would be half a second faster than Mini E, 2 seconds quicker than the 2009 Toyota Prius, and 4 seconds under the Honda Insight. Not too shabby in our book. The lack of a conventional transmission makes it feel very peppy and this car shouldn’t have any problems getting up to speed on the expressway. Think about driving a golf cart. When you mash the gas pedal, it goes and doesn’t slow down for gears to shift. It’s the same thing in the Volt. The car just goes until it tops out without any jerking action that’s normally caused by the transmission. The Volt will come with two different driving modes. One is for regular accelerate and coast type driving. The other is basically a one pedal driving mode. In this mode (which I didn’t like by the way), when the gas pedal isn’t pressed down, the brakes are instantly engaged. It felt a lot like driving in a very low gear at high speeds. This mode does have a purpose though. Driving in this mode maximizes the energy regeneration from the electro-hydraulic brakes and therefore, helps keep the battery charged. This mode isn’t meant for expressway cruising, but more for stop and go traffic where the braking action will likely be performed anyway. We drove the Volt Mule around GM’s Warren Tech Center for about 25 minutes and didn’t use a drop of gas. The Volt isn’t technically a plug-in hybrid. It shares a new vehicle segment called Extended-Range Electric Vehicle with the Fisker Karma. The car has a 1.4 liter engine on-board, but it isn’t connected to the wheels at all. 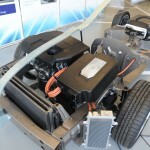 The engine is there to act as a generator and recharge the batteries if they become depleted. This engine gives the Volt around the same overall range as a standard car and kicks in when needed. We didn’t get the chance to experience the switch over during our drive but we hear that it should be seamless. Also, the Volt will probably have enough noise dampening that the small 1.4L shouldn’t sound that loud inside. 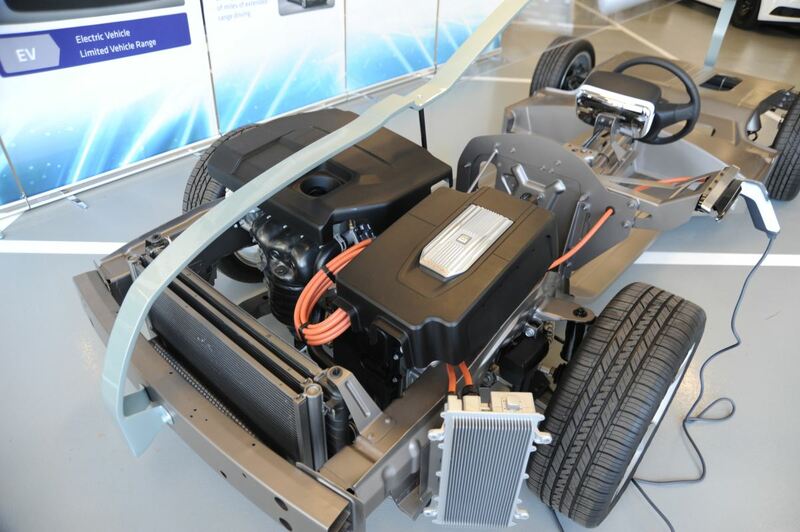 GM claims that the Volt will be able to drive about 40 miles on the lithium-ion batteries alone. That distance, however, is subject slightly to the draw on the electrical system by the heater and A/C unit. We asked the Volt’s head engineer about how much potential distance is lost, and he said only a few miles. The Volt mule was a blast to drive and we can’t wait to see the final product. The next batch of test mules that merry the Voltec powerplant with the production Volt body and interior are under construction right now and are due in early June. Those prototypes, by the way, are right on schedule according to the original timetable. 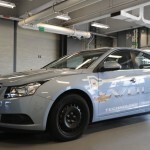 If GM maintains the same breakneck development speed, we can see how not only this car, but the Voltec platform in general, can help save the company. There is already work on the next-gen platform and beyond. GM debuted the Cadillac Converj at the 2009 North American International Auto Show which is built on the same goods as the Volt. Like Frank Weber told us though, GM has put the best of the best on this project and has turned out something incredible in a very short time span. It’s just too bad that the company could not push out other revolutionary vehicles at the same speed.